A little while ago I downloaded the new iPhone app from Scopus, called Scopus Alert Lite. I have finally had a chance to explore it. The app is free, although your institution will need a subscription to Scopus in order for you to use it. Theoretically, you should be able to register using your Scopus user id and password, plus the email address from the institution that provides your subscription. This may encourage some users to sign up for an account. Most of the users I know (faculty and students) don’t realize the benefits of creating a user account with the databases they use. This simple authentication didn’t work for me, and it took several emails to Scopus support to resolve the issue. The app does provide a button to contact support if you fail to authenticate, which was how I got in contact with the folks that resolved the problem. Despite the challenges of registering, I believe that when it works, this is one of the better ways of authenticating subscription content for the iPhone. You can use it anywhere, you don’t have to be on your campus WiFi network or use VPN (like the ACS app) or go through a proxy server (like some database mobile websites). The app is rather slow to load, and several times I received an error message asking me to log in again. Restarting the app seemed to solve the problem. Because the app is focused on setting up citation and search alerts, not general searching, there are some limitations. The biggest limitation is that, for any search, you can’t see more than 50 results, although it will tell you how many total results are available. I think this is a badly needed feature. I kept feeling like I was being short-changed. You can change the sorting order of the results list. The default is by date, but you can also sort by relevancy and citation count. The second limitation seems to be with author searches. Scopus.com has a very nice author ID feature, which helps you identify all works by the same individual no matter what permutation of their name each article uses. 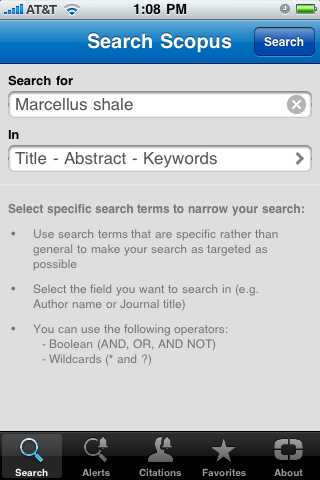 The Scopus Alerts iPhone app doesn’t seem to take advantage of this feature. Affiliation searches are very easy, allowing you to find publications from a particular institution. Unfortunately, alerts don’t transfer between web and iPhone – there is no way to access alerts you have already set up at Scopus.com, and it doesn’t appear that you can get your iPhone alerts on your computer at this time. I am happy to see this first attempt at an app from Scopus. Despite some challenges, I think their method of authentication is actually one of the easiest I’ve seen (once you set it up once, you are all set, and you don’t need to re-authenticate each time). I hope to see some increased functionality in the future, especially access to additional search results. You can read the complete official description of the iPhone app from Scopus (including an FAQ) on the Scopus website.